Andrew: Airing for 11 seasons, Frasier is one of the longest-running spin-off series of all time. But beyond that, it is one of the most critically acclaimed and lauded comedies ever produced, having won 37 Emmy Awards, including 5 consecutive Outstanding Comedy Series awards. And it was often referred to as “the smartest show on TV.” How is it that a series about a stuffy milquetoast living with his brash father could be both popular and praised for its intelligence, in a medium that often rewards the lowest common denominator? By being very, very funny. I sometimes forget just how great of a show Frasier is, as I’ve spent most of my TV-appreciating life in the post-laugh track, single camera era of TV comedies. But despite being a “traditional” sitcom, Frasier was anything but. As co-creators Peter Casey and David Lee state in the commentary track to the pilot, they made deliberate choices to set the show apart, such as making a “no stupid characters, no stupid jokes rule,” eschewing scene transition music and establishing shots, and omitting scenes that are unnecessary to furthering the emotional story of the episode. Casey and Lee figured that their audience would be smart enough to fill in any blanks in the plot resulting from the lack of scenes that other TV shows would include. For example, in “The Good Son,” Frasier reluctantly invites his semi-disabled father Martin to live with him after realizing that Martin can no longer live on his own. Casey and Lee point out how the episode cuts from Frasier and his brother Niles deciding to ask Martin to move in with Frasier directly to Martin moving in. 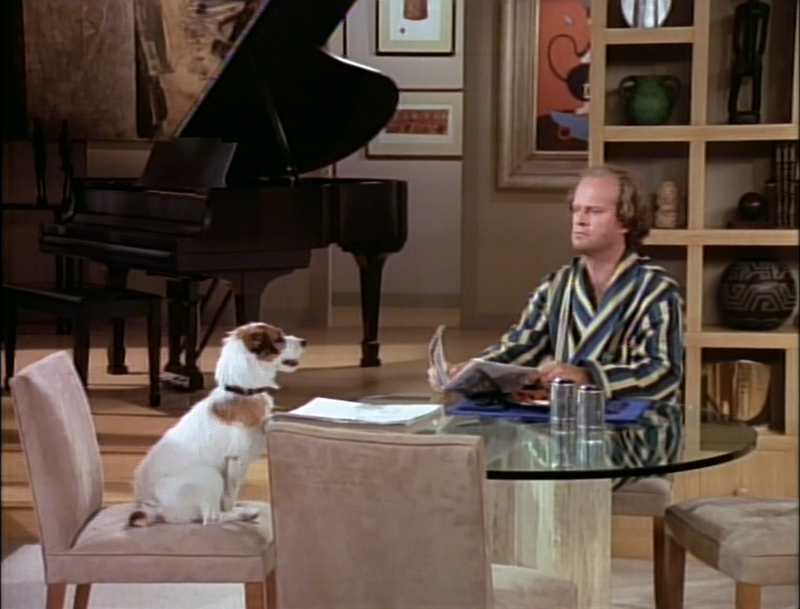 Although a scene in which the brothers ask their father to move in with Frasier could have been funny, it was ultimately unnecessary, as any character insights could easily be introduced in the moving in scene, and viewers would no doubt assume that such a scene had happened. The writers also made sure to always remain true to the characters. Sometimes that meant having brutally emotional scenes, such as Frasier and Martin’s argument about how their new situation isn’t what either of them wanted. The scene is not funny, and it’s not supposed to be. For all of these characters’ quirks and eccentricities, they are very human. Ashley, being the resident Frasier expert, what are your thoughts on the pilot? Ashley: Frasier is easily my favorite series. My parents, avid Cheers fans, started watching Frasier and I was brought into the fold. It’s my “comfort food” show and I’ve probably seen every episode several times over. There’s an episode for everything and everyone, the writing is sharp, the characters have impeccable (almost theatrical) delivery, and because of all that, it stuck with me. I imagine you could ask me to recite lines from an episode and I could deliver a good portion of it. Frasier has had a lot of influence on my life so thank you, Andrew, for the Frasier Expert nod. I think the pilot of Frasier sets up the series perfectly. While some pilots look like a testing ground and can seem a little full or rushed, Frasier starts up in an easier way. 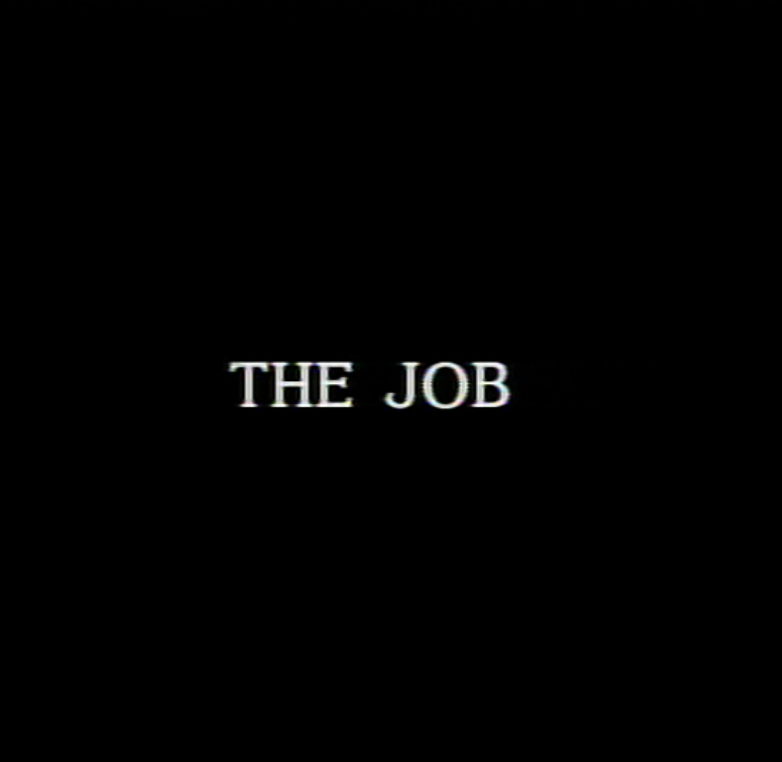 The title cards before each scene set up each part of Frasier’s new life in Seattle: The Job, The Brother, The Father, Eddie, and The Home Health Care Worker. Every facet of this new show is introduced with its own scene. But how do you explain Frasier’s move to Seattle from Boston if you’ve never seen an episode of Cheers (like me at the time this show first aired)? Use a simple exposition using his new job at the radio station to help a caller. He moved because his wife left him (oh, Lilith), his life wasn’t going anywhere, and so he came home to start afresh. Boom, problem solved. This clever exposition is quick and efficient and done well, an overall feeling for the whole show. Within the first ten minutes we’ve already been introduced to Frasier, Roz, Niles, and Martin. Ta-da! The Frasier-verse is born! I need to dedicate a bit to Niles’ introduction because the Brothers Crane might be the best pairing in the show. Their exchanges are both urbane and childish, usually at the same time and they always incite a chuckle. He’s introduced in the Crane Boys’ favorite haunt, Café Nervosa. This initial conversation sets up the brothers’ relationship and that they’re essentially the same kind of man: well-to-do, hold the same profession, educated, and have a penchant for chilly women. Niles is like a carbon-copy of his big brother but he’s also a foil. Despite their obvious similarities in taste and demeanor, Niles still wants to outshine Frasier. Here in the pilot, Niles’ first attempt at one-upmanship is a success: Frasier has to take their father Martin in because Martin doesn’t get along with Maris, Niles never-seen frigid wife (“Maris is like the sun, without the warmth.”). I always appreciated that Maris was such a prominent character but we never saw her. The descriptions throughout the series from various characters painted an interesting picture in my head. Which now brings me to the Pater of the Crane family, Martin. I love Martin because he reminds me very much of my own father. He’s a hard-working, conservative cop who retired from the force due to an injury and who plays a foil to his own children. He’s the Regular Joe to Frasier and Niles’ Frères Heureux (I might send you a cupcake if you get that reference) and subsequent episodes after the pilot delve further into that relationship. And there’s Martin’s leather double recliner. I don’t care what anyone says, I still adore that chair. The hideous pea green and orange recliner becomes its own character. 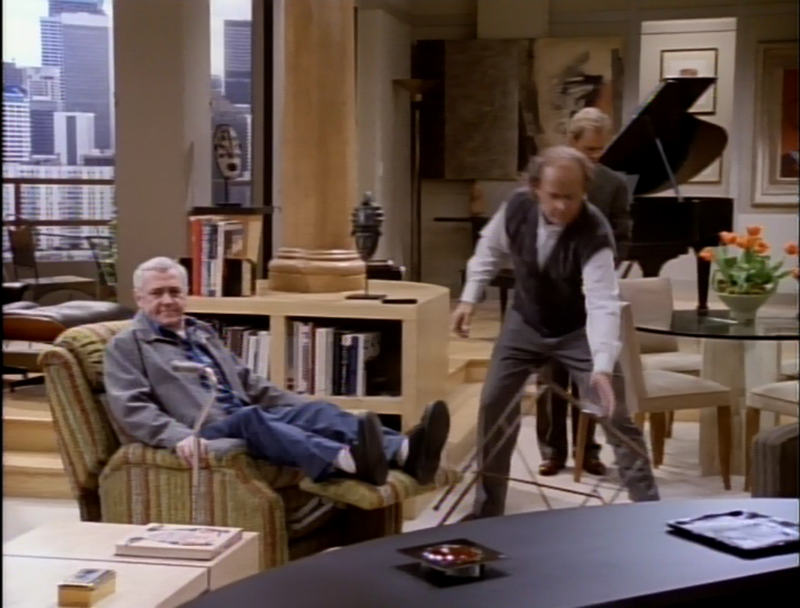 Frasier’s apartment is unspeakably beautiful and decorated with intent and purpose. The art on the walls and shelves, the Coco Chanel couch, the Steinway in the background are all emulations of Frasier’s success and personality. It would only be fair that Martin have the same opportunity in his new home. It becomes a recurring burr in Frasier’s saddle, too, which is wonderful. Andrew: The Frasier and Niles pairing is fantastic. Niles is Frasier to the nth degree, and while you might think it would grow tiresome to see two high-strung, neurotic, snobs bicker behind a pretense of mannered conversation, many of the episode’s biggest laughs come from watching the two brothers try to outwit and outshine each other. Witty dialogue isn’t limited to Frasier and Niles, though. Each character on the show is an expert in verbal sparring. Martin and Roz Doyle, Frasier’s producer at the radio station KACL (named for David Angell, Peter Casey, and David Lee), don’t have the high brow knowledge that Frasier and Niles possess, but they are both smart, competent people who deftly use real-world experience and practical knowledge to take down the Crane brothers’ cultured barbs, even if they don’t fully get the specific reference. The humor in Frasier comes from how its characters interact with each other and react to the world around them. In “The Good Son,” there are very few speaking parts for non-regulars. Aside from a Nervosa waitress and the callers to Frasier’s show, every interaction is between the leads, and each interaction tells us volumes about who the characters are. Frasier telling Martin how he has prepared for his arrival (stocking the fridge with beer, sausage, and cole slaw, and renting a Charles Bronson movie) reveals that Frasier and Martin are polar opposites. Where Frasier is refined, Martin enjoys baser pleasures. Frasier’s first interaction with Roz, in which he cheerfully asks how the show went and she initially avoids answering before bluntly telling him everything he did wrong, sets up that Roz is the expert in the radio business and will tell it like it is when prodded and that while Frasier may be a great psychiatrist, he has a lot to learn about his new field. Daphne Moon, Martin’s new home health care worker, is established as daffy and slightly “off” but well-meaning and cheerful, but her scene’s main purpose is to tell us that Frasier and Martin are going to have a tough time living together. It wasn’t enough for Frasier to say he was worried or to show us how opposite father and son are. We had to see that they will not agree on anything and that Martin will make a choice that affects Frasier’s life, without Frasier’s input, because he knows it will get under Frasier’s skin. You pointed out that the show essentially begins in media res; Frasier has already left Boston and established a life for himself in Seattle by the time the series begins. We don’t see how he got the job at KACL, we don’t see him decide to leave Boston. This goes back to the “omitting unnecessary scenes” idea; Frasier is about how Frasier Crane learns how to deal with change and make lasting relationships. We do not need to see him move or get a job. We need to see how he reacts when he loses what he thought his life was going to be. At one point, he angrily says that he doesn’t want to adjust because he’s done enough adjusting. The series will explore how he and Martin adjust to each other. Which brings me to episode two. After Daphne gives a brief “episode two monologue,” restating to viewers who missed the pilot where things stand, Frasier begins an episode-long quest to avoid dealing with the fact that his life will change. And I must say, for a man trained in human behavior, Frasier does not seem to understand the nature of change. Ashley: I love the title card “Oh, dear God, it wasn’t a dream”, which later ends up being part of Frasier’s very sarcastic dialogue. I can completely relate to his monologue about the sanctity of his morning routine. He has three new living beings in his house and all of them mess up the “magic” that is him: Daphne’s exuberance in the morning, Martin making a high-cholesterol breakfast, and Eddie’s staring while Frasier reads the paper. This episode forces uncomfortable change on Frasier in all parts of his life. Even at work Bulldog invades his booth and Roz’s graphic phone call with her mother throw him off kilter, Niles appears at Cafe Nervosa (and spoils the book Frasier is reading). He really can’t go anywhere to get the solitude he’s yearning to have back. The (literal) three minute conversation between Frasier and Martin at the kitchen table is a scene I’ve always thought was impeccably written. You learn so much about the two characters and the timing and delivery is outstanding. Frasier pours out his emotion pain, Martin tells a story of physical pain. I kind of wish I was in the room when they ran through this scene initially. Andrew: “Space Quest” does so much to fill in and expand on character details. Martin’s love of food that’s bad for you comes back with his choice of breakfast, while Frasier is further differentiated from his father through his choice of breakfast: bran muffins. Roz is an open book, willing to discuss intimate details of her life, in earshot of her colleagues, with her mother. Compare this to the pilot, in which Frasier and Niles repeat their mother’s old adage that “a handshake is as good as a hug.” Niles speaks Italian to order his coffee and thank the (rather bemused) barista. This episode also underscores the series’ core story, which doubles as a great life lesson. Frasier is about how a father and a son learn how to relate to each other. That relationship will take years to develop, as all relationships do. There are no quick fixes, no shortcuts. Frasier and Martin have a long road ahead of them before they will be fully comfortable with each other, and even when they are, there will always be conflict. But the journey will be great. And screamingly funny.